When it comes to getting from Point A to Point B, humanity has innovated a variety of options to satisfy our need for speed — whether its bicycling, rowing, driving, or flying, transportation technologies have changed our lives and movements. Today, more than a century after Ford began building its first car, the transportation industry is again seeing great disruption with autonomous driving and the sharing economy setting the stage for another revolution in mobility, along with accompanying social and economic changes. 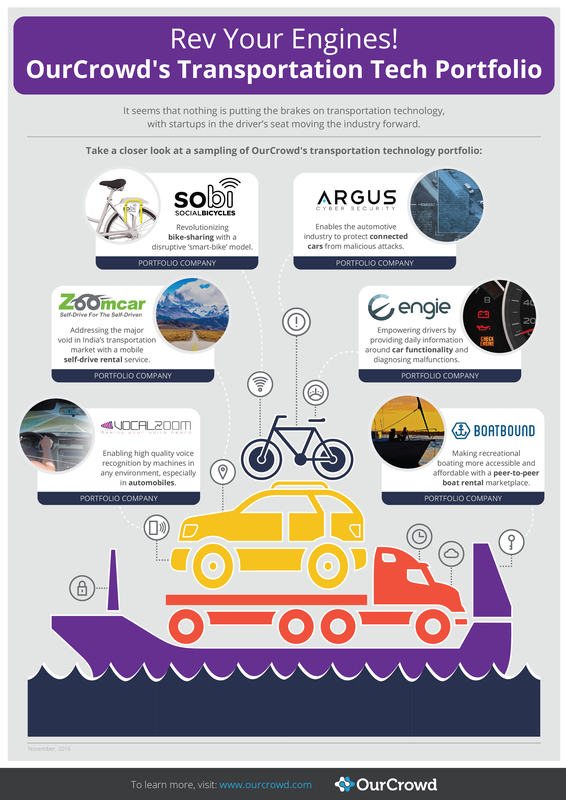 As OurCrowd and our investor community continue to drive the next generation of transportation technologies, we have compiled the following infographic that samples some of our portfolio companies making waves in this rapidly evolving market. Did this infographic steer you in the right direction? Pass it forward and share it with your friends! To find out more about transportation technology and investment opportunities on our platform, contact our Investor Relations team or visit our website. As awareness and concern grow about the impacts of global environmental issues, both individuals and companies are demanding transparency and smarter solutions for everything from energy use management to food supply and agriculture. GreenTech startups have been at the forefront of innovation and creativity, finding new ways to leverage technology to help solve environmental problems and protect our planet. Furthermore, the innovation in this field is attracting the attention of venture capitalists and tech industry leaders who recognize the enormous opportunities for investment and growth. 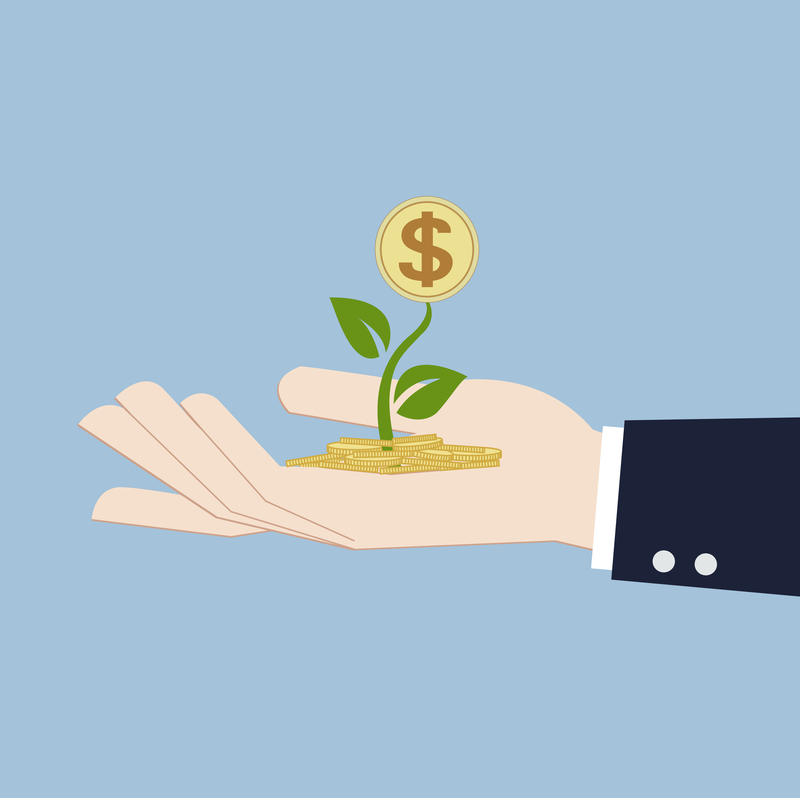 OurCrowd itself has history and experience with investing in and growing GreenTech companies, and has recently announced the launch of Radicle, an accelerator fund dedicated to growing early stage agricultural technology startups into proven industry leaders. 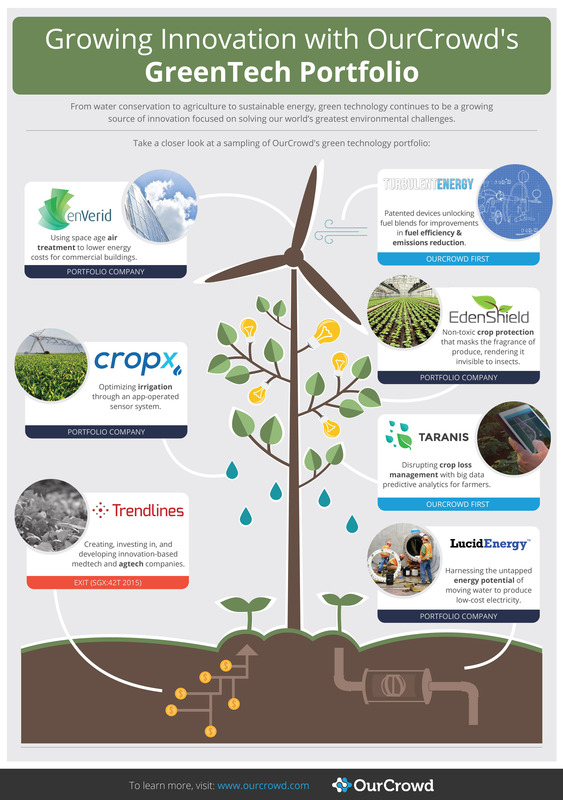 As we continue to build, grow, and invest in sustainable technologies, we’re pleased to share the following infographic capturing the scope of some of the amazing GreenTech companies in OurCrowd’s portfolio. See the growth potential of this infographic? Pass it forward and share it with your friends! To find out more about GreenTech and investment opportunities on our platform, contact our Investor Relations team or visit our website. The need to keep pace with the abilities and threats posed by groups bent on stealing or destroying valuable data has become painfully clear. More sophisticated hackers, with the tools and skills once possessed only by government entities, are engaging in electronic warfare 24/7 and enterprises of all sizes need to protect themselves. This dynamic — a major market need with lots of opportunities for startups — has compelled early-stage investors and angels to get serious about cybersecurity. Cybersecurity is already an incredibly large industry that’s poised for enormous growth over the next several years; estimating to reach upwards of $150 billion by 2019. 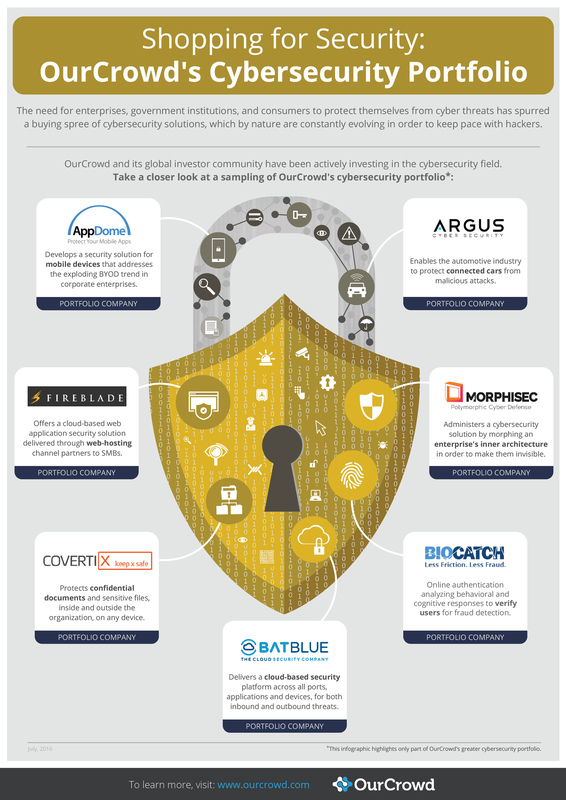 We at OurCrowd, along with our investors, have our bets on a variety of different solutions in the cybersecurity field and have compiled the following infographic that samples some of our portfolio companies making waves in this rapidly growing market. Do you find this infographic helpful? Pass it forward and share it with your friends! To find out more about cybersecurity and investment opportunities on our platform, contact our Investor Relations team or visit our website. ‘Computer-simulated reality’, ‘immersive media’, whatever you call virtual reality (VR) and augmented reality (AR), the artificial multisensory experience its technology offers is only getting better with each passing year. For more than a decade, we’ve seen advances in VR and AR tech applied to military training, urban design, video games, and other home entertainment. As VCs and analysts try to asses the maturity of the VR and AR markets in terms of technology, cost, and use, optimists are betting on 2016 being a defining year for the industry. And how is Israel faring in the midst of all this VR-AR innovation? Principals at Carmel Ventures and Deutsche Telekom Capital Partners believe Israel has great talent in this area and plenty of room for more growth. 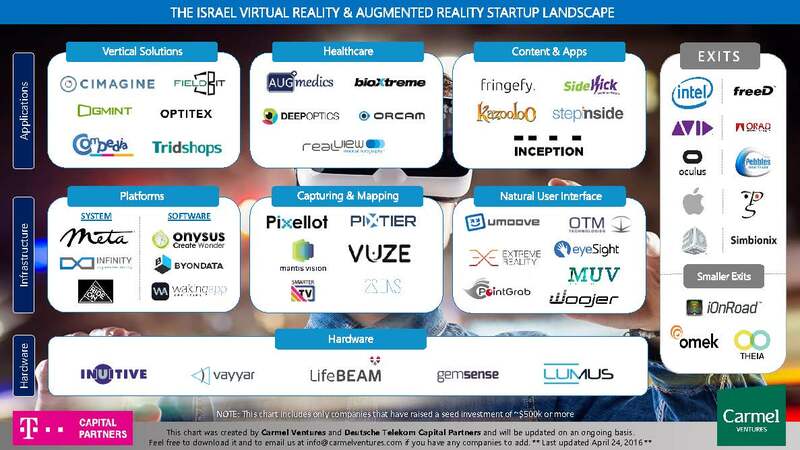 To help visualize the country’s VR-AR innovation activity, Carmel Ventures and Deutsche Telekom Capital Partners created a map that depicts the Israeli landscape of startups in the areas of Virtual Reality and Augmented Reality. Out of the featured VR-AR startups operating in Israel, 3 are OurCrowd portfolio companies! Kudos to Cimagine, MUV Interactive, and Replay Technologies (Recently acquired by Intel) for growing and supporting the greater VR-AR ecosystem going forward. To find out more about Virtual/Augmented Reality technologies and investment opportunities on our platform, contact our Investor Relations team or visit our website. Does technology seem to be getting bigger and better by the day? To us it looks our ordinary ‘things’ are actually getting smarter. If you haven’t heard the term by now, the Internet of Things (IoT) refers to the growing trend of machine-to-machine connectivity, where Internet-enabled “dumb” devices have a network connection to collect and utilize actionable intelligence about everyday life. Over the past year, there has been a growing amount of impressive IoT activity in the startup world, and OurCrowd’s IoT portfolio represents a variety of companies supporting the greater IoT ecosystem. 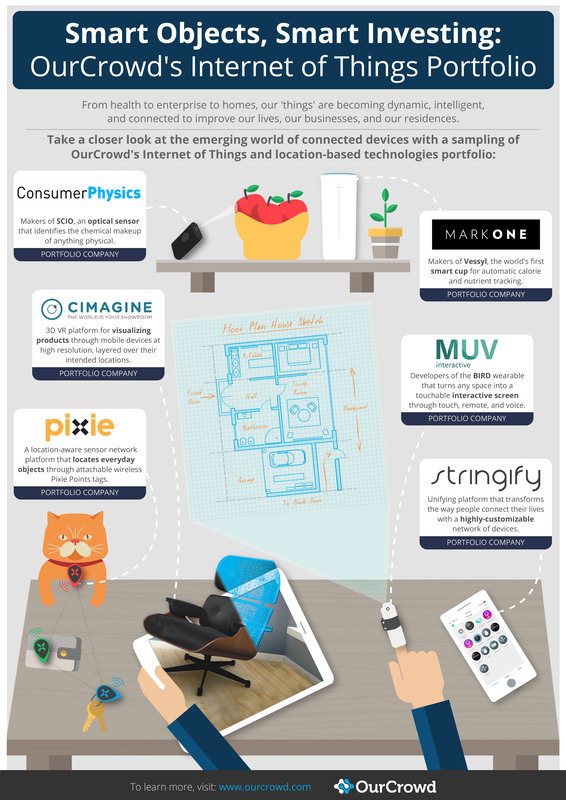 To capture the scope of this emerging world of connected devices, here’s an infographic to provide some insights into the scope of Internet of Things and location-based technologies. Does this infographic seem ‘smart’ to you? Share if you find it helpful! To find out more about IoT technology and other investment opportunities on our platform, contact our Investor Relations team or visit our website. The smartphone may be smart, but it’s no longer simply a phone. From consumer apps and hardware to enterprise software, mobile technologies and innovations are a leading focus area in startup investing! Which begs the question: What are the next-gen mobile technologies that will change our lives? 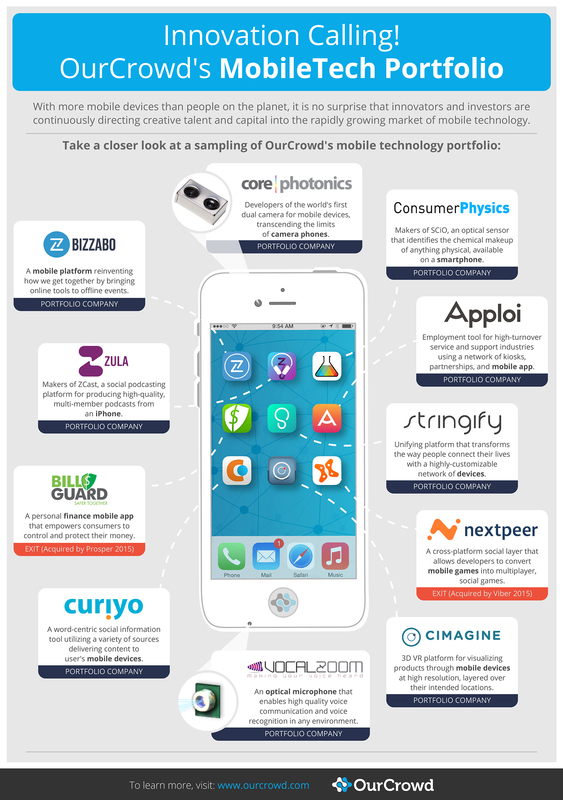 OurCrowd’s MobileTech portfolio encompasses a variety of technologies, overlapping with various sub-sectors, such as MedTech, Enterprise, Consumer, and more. Two out of our four portfolio exits are mobile technologies: BillGuard, a personal finance app fighting credit card fraud that was acquired by Prosper in 2015, and Nextpeer, an industry leading mobile gamers network acquired by Viber in 2015. 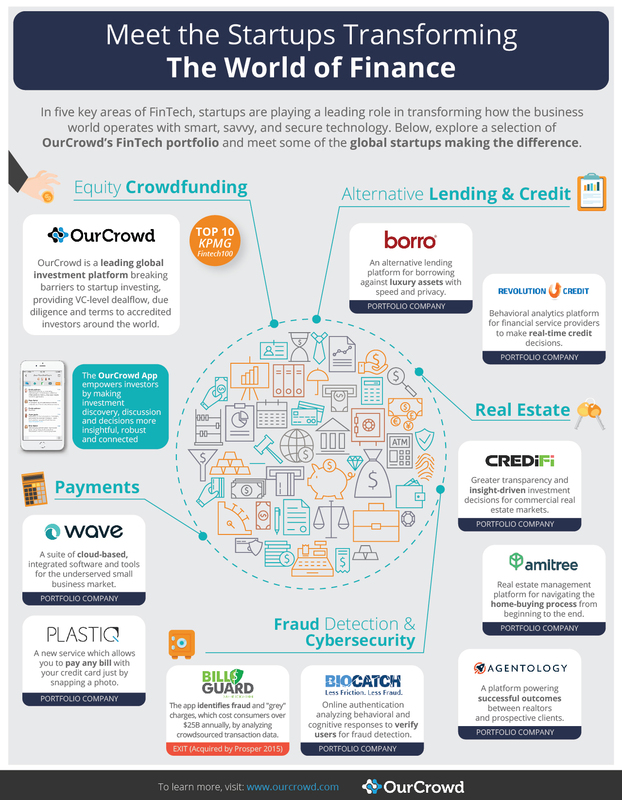 As we continue to build, grow, and exit mobile technologies (among others), we’re pleased to share the following infographic capturing the scope of some of the amazing MobileTech companies in OurCrowd’s portfolio, proving themselves in this growing industry. Does this infographic call out to you? Share if you find it helpful! To find out more about mobile technology and other investment opportunities on our platform, contact our Investor Relations team or visit our website. How do you feel today? Feeling good? Consider for a second your local hospital or doctor’s clinic: The ER, the OR, the lab, the tabletop devices, the drugs and wearables. With constant updates and developments of tech solutions servicing the healthcare and medical industries, the future is bright for MedTech sector, and exciting for both entrepreneurs and investors. Medical technologies are a key focus area for OurCrowd’s investment strategy and comprise over 18% of our overall portfolio. In fact, our first company to exit was ReWalk Robotics (NASDAQ: RWLK), an exoskeleton for people with spinal cord injuries, in 2014. 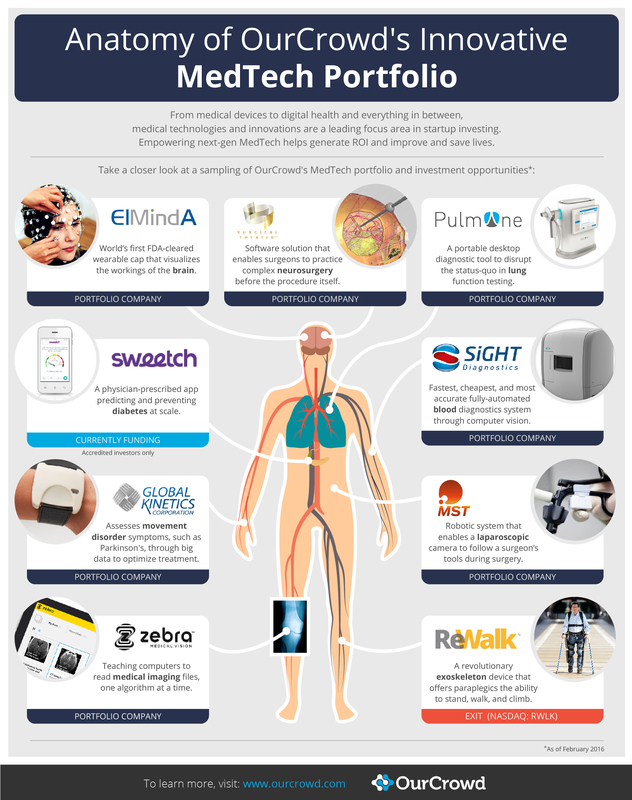 As we continue to build, grow, and exit medical technologies (among others), we’re pleased to share the following infographic capturing the scope of some of the amazing MedTech companies in OurCrowd’s portfolio, proving themselves in this growing industry. Feel good about this infographic? Share if you find it helpful! 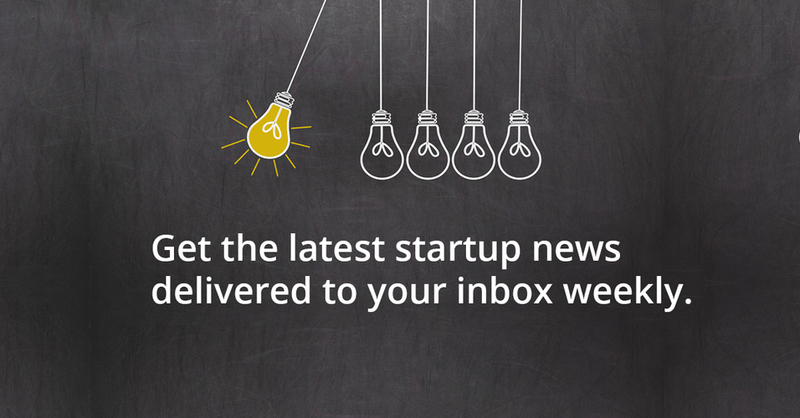 To find out more about digital health, MedTech, and other investment opportunities on our platform, contact our Investor Relations team or visit our website.